Just one token can lead you to a hidden treasure. I was walking the floor of the Waukesha Coin Show when I found a dealer I’ve had luck with in the past. He had a Civil War token from Waukesha, Wisconsin, a city west of Milwaukee and my home town. It had a symbol of a boot on one side and H.W. Sherman — Dry Goods, Hat, Caps and Groceries, Waukesha Wisconsin on the other side. I’m a fairly new collector and this was my first exposure to Civil War store cards and thought it was neat to see one from Waukesha. I walked back over to the other side of the hall, looking at other coins and then lit hit me (that feeling you probably know as a collector)… I had to have that token. It was from Waukesha and part of my hometown’s history. What was the story behind it and who was H.W. Sherman? I felt a strange anxiety that someone had purchased the token. I had to get there before it was gone. I hustled back to the dealer. It took all the money that I had with me, but it was worth it. So began my search for H.W. Sherman and his store. 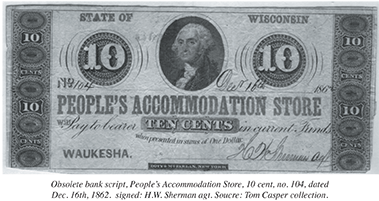 The first ad for the People’s Accommodation Store appeared in the following week’s Freeman, May 20th. Henry’s ad states his store is located “one door east of C. Jackson’s Drug & Book Store, Main-st.” I’ve attempted to find a photo of Henry’s store. An 1854 photo of Main street Waukesha shows an awning one store past C. Jackson’s Drug & Book store identifi ed by the “giant mortar” sign on the right side of the street. I assume this to be the C. Cork store that Henry took occupancy of. 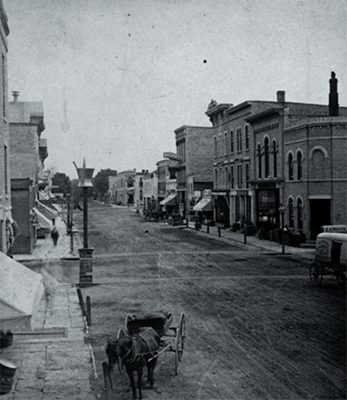 About 1854, Main St.. Waukesha looking east towards Five Points. C.Cork’s store awning just beyond mortar sign. (center of photo). Source: John Schoenknecht collection. 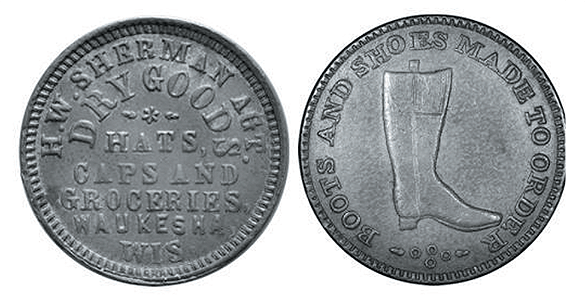 Henry also issued tokens or store cards. He would have ordered them sometime in 1862 to early 1863 from a die sinker named Lanphear from Cleveland, Ohio.10 There are three known Civil War Store Cards from Waukesha, Wisconsin: J.A. Dunbar, Charles Cork and Henry W. Sherman Agt. They all sold groceries and dry goods. Two years after opening the store, a partnership between C. Jackson and Henry Sherman regarding the People’s Accommodation Store was dissolved on June 27, 1864 and the announcement stated “entire stock of goods will be sold at unprecedentedly low figures.”11 Shortly afterwards, on Sept 6, 1864 a young townsman R. L. Gove leases Sherman’s store and announces he is filling it with a “choice assortment of boots and shoes.”12 I found a photograph of Main street from 1870 that shows the store east of C. Jackson’s with a sign: R L. Gove – Boots & Shoes. In a Sept 20, 1864 Freeman ad for R. L Gove’s store “People’s Boots and Shoe store” states its “Now Ready for Fall and Winter Trade” and references “Sherman’s Old Stand”. The building next to C. Jackson’s has changed since H.W. Sherman occupied it. At one time replaced with a new building by the National Exchange Bank in 1893. 13 Today, at 311 W Main Street, the building is home to Art & Framing 123, a custom picture frame studio. Some remnants of the old bank structure are still there but overall it has been remodeled with a cream city brick exterior and a simple inviting front door. The C. Jackson building still stands as it did in the 1860’s. It now is Black Dragon Tattoo. You can lean against the exterior brick wall and envision horse drawn wagons pulling up to load supplies. I learned a lot about Waukesha’s history and some of its early pioneers as I was researching my token. I find it amazing how much enjoyment one token can bring. I still have more to uncover about Henry Sherman and a few mysteries to solve. I’m still looking for a picture of his store. It’s like searching for hidden treasure. 6) Wisconsin Obsolete Bank Notes & Script, Chester L. Krause 1994 p. 476. 7) Notes from contacted collectors and from the Eliasberg & Krause Collections – 3/2/2010 Lot 3307, Chester L. Krause Collection. 8) Waukesha Daily Freeman, Centennial Edition, 1859- 1959, Section A p. 10. 11) Waukesha Freeman, June 28, 1864 p. 2. 12) Waukesha Freeman, Sept. 6, 1864, p. 3. 13) Exchange Bank opened in 1882; Depression closed it, Waukesha Daily Freeman, Centennial Edition, 1859- 1959, Section L, p. 20. Randy Raikes can be contacted at rraikes@wi.rr.com. This entry was posted in Waukesha Collections by Editor. Bookmark the permalink.